They say, the fragrance always stays with the rose – if though it is passed from one person to another. Among all the flowers that are out there in any garden of the world, roses have always been special. Be it a significance of love or an indication of friendship, this flower has always helped to convey those deep down feelings. As a matter of fact, though these flowers have thorns as well, yet this flower is a deep symbol of lot of strong feelings. In fact, the Real Meaning Of The Different Rose Colors teaches us to face the rigours of life (thorns) and appreciates the beauty of life (the beauty of the flower). Colors have an impact on art and on life and even on psychology – read and understand! All of us, must have surely got or given lot of roses to each other – be it to the other person we adore, or to our friends as a token of love and gratitude. They are not only flowers that look good, but they also spread good vibes through their fragrance.. Oh God, we can just go on and on about roses, isn’t it? 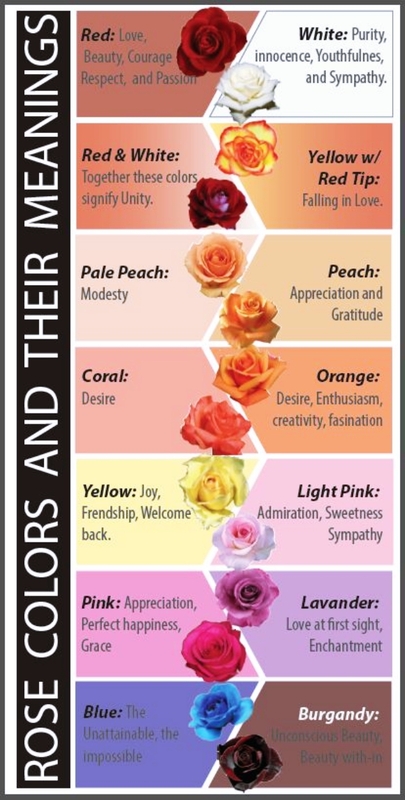 Well, wait, but did you ever wonder, about their different colors of roses and what they actually signify? Just like some people read a lot about their zodiac and believe in it deeply; they also take the colours and their meaning seriously. White has always been a color that is associated with peace and serenity and that is exactly what the white rose also represents. This colored rose depicts innocence, purity and secrecy. When somebody gives this color rose, it means that they really value your relationship and they feel you are quite worthy of it. Lily tattoos and meanings to know before you get them inked is right here if you are not a rose lover. Do we need to say anything about this color? There is no doubt in the fact that this color rose represent love. This is the most common color amongst all the roses, and that is why, irrespective of knowing the meaning of the rose, people might just as well buy it, because they like rose. However, this colored rose also represent courage, beauty and respect. The dark red rose goes a mile forward and represent that the person is ready for a long term commitment and has deep passion. If there is any color that could represent friendship, then it is bang on this one! This is the color that talks about pure friendship, joy and a start of something new. When someone gives another person a yellow color rose, it is their way of saying that they care. Golden rose also can fall under this category, because it looks quite similar, plus the meaning are also close. The golden rose means, welcome back! Pink has always been a favorite among girls and that is when people picked up this color as a common color. When you talk about this color of roses, it means happiness, romance and admiration. It can also be used as a token of thank you and trust. You have light pink roses, which represent gentleness and grace while the brighter pink talks about gratitude and appreciation. When somebody gives you this colored rose, it means that they want to move the bond a step further, but are not sure about what and how. It also talks about modesty and that is when people give it to those people who carry themselves with utmost elegance and are quite down to earth. It also represents sympathy. 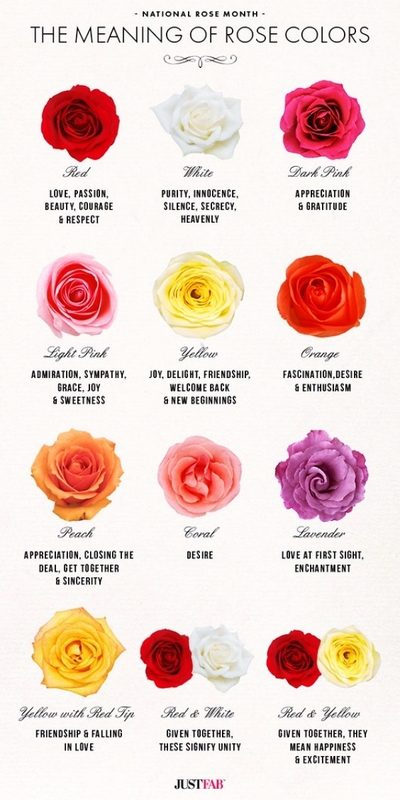 These colors in roses talk about deep desires and enthusiasm. 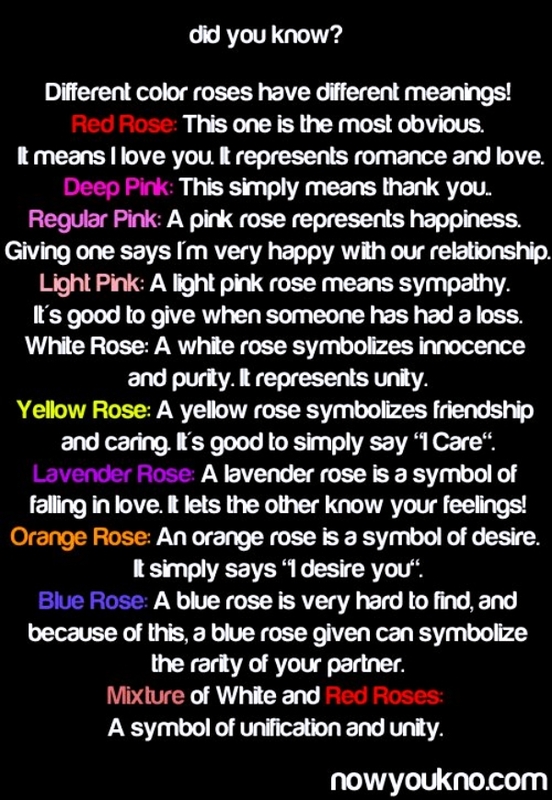 They also signify a person being proud of the other person, who is receiving the rose. 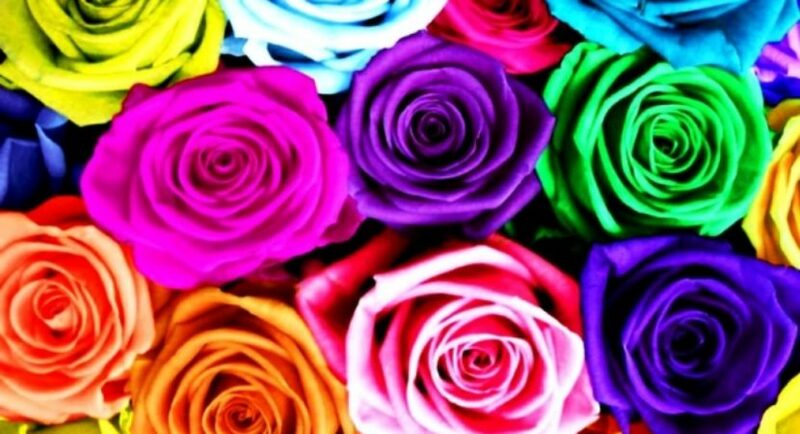 This is one color out of all the roses that represent high energy and fascination too. Roses have always been a part of love stories. If you want to signify love at first sight, then lavender is the color you must choose. It also depicts royalness and serene beauty. The color in itself is quite novel, and the sight of it can bring a smile on anyone who sees it. Black color is very rarely used because it shows farewell and goodbyes. It the color that talks about grief and losses too. On the other hand, blue color talks about mystery and ambiguity. It also talks about achieving the impossible. Purple colored roses talk about majesty and a magnetic pull while dark purple represents enchantment of one person towards the other.